Searching for a tablet durable enough to use in your business? Now you have the perfect match with the Unitech TB100. 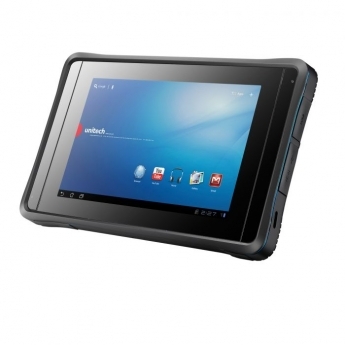 With a great list of unique features for ultimate flexibility and free software to help you easily manage and support your business tablet, it's time to choose the high quality and rugged Unitech TB100. New Versatility Tablets are increasingly becoming essential tools used in business environments because of the need for larger viewable screens to support customer facing activates. Imagine your salespeople being able to show your customer all the suggested add-on accessories and service to that product in one easy to view screen, then taking their order without having to leave the customer's side. Thanks to the integrated WWAN 3,75G feature, the TB100 is also a great tool for field service and route sales automation. Employees working outside the four walls will benefit from the TB100's fast speed and durability to bring your business a new competitive advantage when facing your customers. Rugged tablet with Gorilla® glass For a professional tablet user you need a tablet to be scratch and drop-resistant. During working hours accidents happen but buying tablets on a regular basis to replace the old ones doesn't fit into any commercial business strategy. That's why the TB100 is equipped with a 7" WXGA TFT LCD multi-touch display of GorillaTM glass. This type of glass is not only offering excellent visibility inside as well as outside, it's also a extremely durable. The combination of this unique glass, an anti-slip rubber bumper around the main body, an IP65 rating against moisture and dust and a 4ft drop threshold, makes this tablet is the solution for all your business demands. Don't settle for a consumer grade tablet, choose a long term solution in the TB100!